How to make Greek calamari. 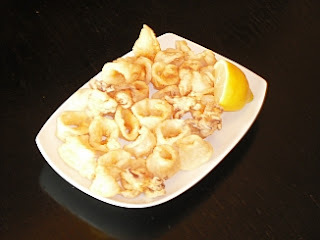 Calamari (Kalamari) is a well-known dish all over the world - the plural is actually Calamaria. They are actually fairly simple to prepare, but a lot depends on the quality of the squid. Fresh Calamari will be more tender than the frozen squid, and in Greece we usually have it fresh. The recipe below is for fresh calamari. You should be able to find the Greek spirit Ouzo where you live. Put the calamaria in a bowl of cold water. Remove the insides - making sure to remove the long thin transparent part – and the eye. Discard them. You may also remove and discard the thin skin, though some people don’t. Rinse the calamaria well 3-4 times in cold water, making sure you rub the small tentacles well to remove any sand that may be stuck there. Cut the bodies into rings approx. 2-3 cm wide. Put the rings and the tentacles into a bowl and add salt (not too much). Then add the ouzo. Cover the bowl and put it into the fridge for I hour to marinate. After the hour has passed and you have removed the calamaria from the fridge, put the oil into a deep frying pan and heat very well – it has to be really hot. Put the calamaria in a colander and drain well and then place on absorbent paper to absorb any remaining liquid. Dip the calamaria in the flour and cover them well. You can do this all at the same time or in stages as you fry them. Shake them a little to remove any excess flour and then fry them a few at a time (if you put too many at a time, it cools the oil) for approx. 2-3 minutes. Don’t over-fry as they will become hard. Put them on absorbent paper and them serve them hot with a piece of lemon on the side. I love this recipe. Its one of our favorite dish.